There a common misconception that the average Joe computer user, like you and me, are in grave danger from Rufus Wallbanger, slumped behind his computer somewhere in Eastern Europe, or Moo Choo Wing Wang , somewhere in China, briskly looking for computers to “hack”. But this isn’t how it works. I’m really reluctant to tell you this, but you are a low value target. No hacker is going to hack into your computer, no matter how important you think you are. That’s not how it works. Mr. Wallbanger and Mr. Wang, or any hacker worth his or her salt, are going to be hacking high-value targets like retail stores, banks, credit card companies, governments, and so on, not you Joe, not me TC, not you Sally. Nope not even EB -she only thinks she’s a high-value target. So if you’re one of the many who think they’ve been hacked, you almost certainly haven’t been. The closest most of us will ever get to being hacked is foolishly downloading and installing malware which turns our computers into zombies and makes them part of a botnet or accessible by remote control by hackers. 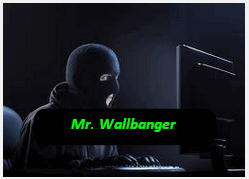 And while Mr. Wallbanger or Mr. Wang may be using hijacked computers to send spam or launch DDoS attacks or steal personal info, they didn’t personally hunt you down and steal your stuff. You’re not a high-value target and neither are we, I’m sorry to tell you. You are much safer from hackers than I am from EB. Most of us who grew up with Windows 3.1 or Windows 95 were taught to defragment our disk regularly lest our computer become a slow heaping pile of junk. Windows in general back in those days was a slow heaping pile of junk – but hey! We didn’t know any better. It was either a $700 Windows computer or a $1500 Apple computer. Most of us didn’t need a computer bad enough back then to spend $1500. Anyway, back in the Windows 3.1 and Windows 95/98 days, there were plenty of companies making defrag software to help defrag your hard drive. Some were free, some were not, and some were malware. And back in those days, defragging your hard drives was pretty important, although, I’m sure, not as important as those who were selling defrag software at the time would have liked you to believe. But folks, this is 2016. Windows 95 is twenty-one-years-old. Beginning with Windows 7, defragmenting hard drives is done automatically by Windows as part of its normal self-maintenance routine. Why, I would dare say Windows 7, 8, and 10 do a better job of maintaining themselves than EB does, but that’s another story. The fact that beginning with Windows 7, disk defragging is done automatically by Windows, has not stopped purveyors of fine software from pandering to the fears of those who think their hard drives will explode from fragmentation. I assure you they won’t. And if you have a solid state hard drive, or SSD as it’s known to those who know, you don’t need to defrag at all and Windows is smart enough to know this. If you attempt to defrag SSDs – YWBS (You Will Be Sorry). If you’re using Windows 7, 8, or 10 and you’ve installed a utility to defrag your disks, you might want to think about uninstalling. You don’t need it running in the background; you don’t need it at all. We have gone round and round on this one with many of our readers over the years. But finally, the consensus of those who call themselves experts and those who really are experts, is that shutting down your computer every night is not necessary and my shorten your computers life. Why? Because starting and stopping causes more wear and tear than letting it idle. Plus, when you want to use your computer in the morning you can use it instantly; if you have to power it on each morning, it may take a while before you can use it. But then again, maybe some of you like to use that time to brew a pot of coffee. Think of this: Do you think Web servers go to sleep at night? Have you tried to google something at 3 AM? Was Google sleeping? Nope. We servers run 24/7/365 and a Web server is nothing but a computer. There are no good reasons to shut your computer off at night or put it to sleep unless it’s a laptop running on battery power. For desktops, all-in-ones, or laptops which are plugged in, set your display to turn off after 10 to 15 minutes and never put your computer to sleep. You can do this in Control Panel / Power Options. We know we are going to get raked over the coals on this one, but we’re telling you this causes much less wear and tear on your computer. And if you’re concerned about the cost of electricity – your monitor uses the most electricity – not your idling hard drive. Believe it or not. We’re telling it the way it is. Leaving your computer on 24/7 is something I stopped worrying about years ago. How about going offline when you’re not using your computer? I used to hear warnings that staying connected 24/7 left your computer vulnerable. What say you, oh great wise guru? Depending on your laptop (and some older desktops as well) the CPU fans and video card fans run all the time, whenever your power is on. Some newer PC’s have improved fan controls that idle down or stop rotation when the PC goes to sleep or CPU processing demand is low but this usually does not include the video card fan(s). I have had at least 3 video card fans that have stopped rotating and needed to be lubricated to restore their function. When you have anything mechanical like fans and conventional HDD’s it’s all about MTBF (mean time between failure) which is the manufacturer’s best guess as to how many hours their product will run before failing. With conventional HDD’s that can be 100,000 hours or more or about 11+ years but not so much for your fans. When a fan goes south it can often take along the electronics that relies on it’s cooling or at best limits the CPU performance until it’s repaired. Another problem with PC’s being on all the time is the issue of dust, cat hair and cigarette smoke, all of which will plug up the cooling fins of any device with a fan. I speak from experience have cleaned several PC’s that wouldn’t run any longer due to overheating. Most PC’s have no air filtering at all so the more they run, the more they pull crap into their innards. I don’t shut down my PC’s all the time but generally do overnight or when I’m away for longer periods of time. Wow – a lot of information. I’ve got a 7 year-old desktop that ran almost all of the time and I never shut it off – except to reboot after an update or when installing a hardware component or every week or so just to refresh Windows. I ended up giving that computer away and it’s still running. I think good maintenance means cleaning up the vents and inside the computer to remove dust. And it is true that Web servers run in clean rooms with filtered air and cool temperatures. My article was not meant to be construed to mean never shut down your computer. If you’re going to be gone for a day or longer, by all means you should shut it down. And you’ll need to shut down or restart Windows occasionally too. We meant that generally, shutting down every night is not necessary. I leave mine running most of the time and put it in Airplane Mode at night. But to each his/her own. I don’t think you’ll extend a computer’s life by shutting it down every night and turning it on every morning. I think, in fact, that will tend to shorten its life – cigarette smoke and dust aside. You say never put your computer to sleep? Then I have been doing it wrong. I shut my display down but set my computer to go to sleep. Is there a reason not to put it a sleep?? Re: Turning the computer off. Due to reading this information from you years ago, I never turn my computer off. I use a specially-selected series of photos as a screensaver, and that is never turned off either. In fact I enjoy seeing it whenever I pass the computer room. I am not wealthy, but my power bill is never a problem, so I don’t think the screensaver uses much power. I like to find the computer ready to go in the mornings. Thank you for this advice, I’ve tried it and found it’s perfect for me. I have a problem about leaving my computer on at night. How many kilowatts does the computer consume after 12 hours? Also what about burn outs e.g. electrical storms? And what is the difference between putting it to sleep and leaving it on awake all night? J.P.
Average wattage used by laptops (plugged in- display off) is about 20 watts. Desktops can use between 60 and 100 watts. Sleep in Windows 10 is a hybrid of hibernation and sleep – it takes 2 or 3 minutes after you “wake” the computer until you can use it. Whereby if you just dim the display and leave the computer on, it’s ready to use instantly. Back when my Compaq – computer – I would shut it off at night. My Compaq was used for 13 years. I also would shut of every night. I never had any problems, in fact I could use it today, but Tech’s at Staples cleaned out the info and swapped some of the information on my HP. I have no disks, so I could run this older computer. I bought an HP desk top 3yrs ago, I have had problems with this computer. I have brought it back to staples this HP computer about 5 times. I downloaded Window’s 10 back in October 2015. Sometimes it works well other times it is a pain. I would love to smash it. But of course my warranty is no longer usable. Hopefully it will perform for at least another year and I would like to try a laptop. Just a note, some of the problems with VerizonYahoo have been giving me problems. I have learned a lot from you and Darcy, please keep it up.